Marriage is the origin of society, as society came from family which is a product of marriage. The power and beauty of marriage is in its alignment with and obedience to the precepts guiding marriage as spelt out by its originator, creator and designer. A society-driven marriage is opposed to God’s standard and can never be pleasing to Him so long as it remains society-driven. The quality and future of anything is largely dependent on environment; just like a seed on a golden chair simply remains “a seed on a golden chair” except it is properly planted in the ground (the right/ideal environment), no marriage succeeds outside God; Marriage only succeeds in an environment of “Kingdom Culture”. God remains the sole source of a marriage that works, and such marriages are to influence society for Him (Matthew 5:14-16); this is the ideal order. It is inappropriate to reverse this order as society has unimaginable ways of perverting marriages via its limitless avenues and strategies to distract couples from the basic tenets that make marriage what it should be. The result of society-driven marriages is a vicious cycle of dysfunctional homes/families plagued with untold vices, which in turn have immeasurable impact on the society, as we see in our world today (God have mercy!). 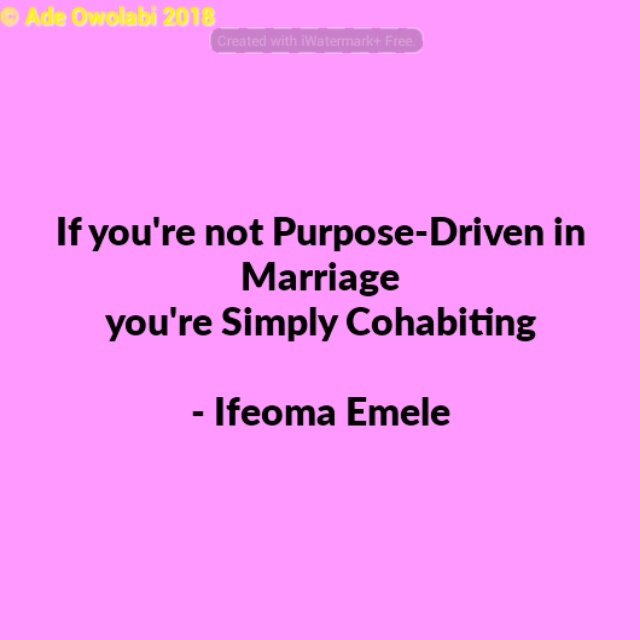 Do you desire to make headway in your marriage/home? Do you desire to play your part in making the world a better place? Direction is superior to speed, doing it wrong will not make you right with God. “RIGHT” is never what society calls right, but what God calls it. Remember, no marriage has what it takes to make it outside God. Marriage only succeeds when God is in it, (a marriage void of God is one that is bound to fail). God will be involved only to the extent to which we allow Him; He really wants to be at the center of it all, trust me- that’s the only way it can work i.e., the only sure way to building a healthy society that’ll be safe for generations to come if Jesus tarries. Don’t ruin your union and your place in God’s plan, if you have not been in agreement with God’s idea of marriage, please make a U-turn; it is needful! Except you are okay with where you are. In that case, you must also be okay wherever that choice of yours leads you. Your relevance to the society is a function of your relevance to God’s idea of marriage. If your marriage is ‘useless’ to God, it is indeed useless (I am afraid to say…). However, you can make a change starting NOW. Decide to agree with God’s terms and conditions for marriage; let the man be “the man“, the wife be “his help“; let both man & wife draw grace from a robust walk with God, as they learn to be better at their respective roles to God’s glory. Being society-driven undermines your ability to positively influence and impart society for God, which is a key reason for our being here in the first instance.